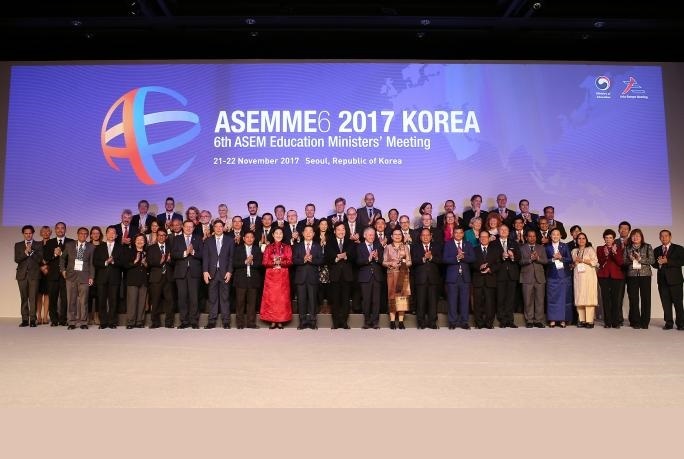 Cedefop expert Slava Pevec Grm and European Training Foundation (ETF) expert Michael Graham presented the 2017 update of the global inventory of regional and national qualifications frameworks at the 6th ASEM Education Ministers' meeting in Seoul on 20 November. The two-volume publication gives an update on the national qualification frameworks (NQFs) around the world. It provides information on national and regional developments as well as selected themes. It is the result of collaborative work between Cedefop, ETF, UNESCO and the UNESCO Institute for Lifelong Learning. Presenting the inventory, Ms Pevec Grm said that Cedefop coordinated the third edition in 2017 (the first was in 2013 and the second in 2015). A further update has been announced for 2019. The publication captures, records and analyses NQFs in 100 countries in five continents. It also covers seven world/regional frameworks including the European qualifications framework (EQF). The country-by-country chapters are supported by transversal analysis of the most important issues in qualifications frameworks such as lifelong learning, validating non-formal learning, building qualification systems, quality assurance and impact. Evidence shows that the number of NQFs has stabilised at around 150, but they are more established, especially in Europe, South Africa, the Pacific and some Asian countries. Between 2015 and 2017 countries have been strengthening cooperation by linking to regional frameworks. In Europe, 33 of the 39 countries that participate in the EQF are now linked to one another by this framework. In Asia, the ASEAN reference framework has entered implementation. The inventory found that NQFs need to be supported by a qualification system and that four main components are common in almost all of them: proportionate legislation; sustained stakeholder involvement; institutional robustness; national quality assurance strategies. NQFs provide visible structures and common standards to support recognition and validation of non-formal learning. Established NQFs have mainstreamed validation systems as, for instance, in France and Scotland. Quality assurance may be integrated in NQFs, or linked to them. Learning outcomes form the common conceptual basis of almost all NQFs. The two main conditions for the NQFs to have impact are sustainability and visibility. Most impact has been observed in: move to outcomes in qualifications; transparency of systems of qualifications; validation of non-formal learning; stakeholder engagement in qualifications. Areas of less impact are: visibility to learners and employers; pathways within national systems.